EC on the Athlete CEO Podcast - I joined the Athlete CEO podcast to talk about everything from entrepreneurship, to the origins of Cressey Sports Performance, to off-field habits that athletes can employ for success in their sport. This is a great new podcast that I'll be following closely myself. Some Squat Stumbling Stones and Solutions for Successful Squat Supremacy - Dean Somerset outlines some common squat faults as well as some potential solutions for them. Tone and Message in Coaching - The Resilient Performance crew never disappoints with their writing, and while this is a quick read, it's an excellent one. The supine banded shoulder flexion on roller is a new shoulder mobility drill I came up with that is really growing on me quickly. Effectively, it's an alternative to a back to wall shoulder flexion for those who may struggle to "compete against" gravity as they take the arms overhead in the standing position. 1. The foam roller provides feedback for posterior pelvic tilt, thoracic extension, and a more neutral cervical spine posture. 2. Gravity assists the individual into overhead motion to overcome stiffness through the lats, teres major, long head of triceps, inferior capsule, pec minor, etc. 3. The fact that the roller doesn't impede scapular motion (like the wall or floor would) makes it easier to achieve some scapular posterior tilt as the arms go overhead. 4. The supinated grip drives some shoulder external rotation, placing the lats on stretch in the transverse plane so that folks can't "cheat" the movement by letting their hands drift toward the midline. I'll take this over a few sets of ugly band pullaparts any day. What's not to like? Looking for more cutting-edge shoulder strategies like these? Check out my new resource, Sturdy Shoulder Solutions at www.SturdyShoulders.com. New Rules for Being a Strength Coach - Todd Hamer wrote this great piece up for EliteFTS, and I love the concept of continuous improvement in strength and conditioning. Todd's a guy who is always seeking to get better, no matter how long he's been in the industry. Having an Approach to Having an Approach - This was a guest blog I wrote for my business partner, Pete Dupuis, a few years ago. I cover some fitness business concepts, including networking and lifetime value of a customer. 5 No-Diet Ways to Get Lean - I really liked this article from Dani Shugart on behavior modifications for nutritional success. My body weight yesterday was 181.2 upon waking, 188.6 before bed, then 181.6 again this AM. Take-home point: you're dehydrated when you wake up. In summer baseball, a lot of players have 9am games in 90+ degree weather. Coaches: get on players about hydrating early and often. Two years ago, I published a post, Tinkering vs. Overhauling - and the Problems with Average, where I discussed the pitfalls of focusing on population averages, especially in the world of health and human performance. I'd encourage you to give it a read, but the gist is that you have to be careful about overhauling a program because you see someone as being outside a "norm" that might have been established for an entire population when they are unique in so many ways. Thoracic spine mobility is an excellent example. What would be considered acceptable for an 80-year-old man would be markedly different than what we'd want from a 17-year-old teenage athlete in a rotational sport. This athlete, for instance, had some marked negative postural adaptations that contributed to two shoulder surgeries during his time as a baseball pitcher. If he was far older with different physical demands, though, he might have never run into problems. On the left, we have a professional baseball pitcher. In the middle, we have an aspiring professional golfer. And, on the right, we have a powerlifter who's moved well over 600 pounds on both the squat and deadlift. Adaptation to imposed demand is an incredibly important part of this discussion of "normal." The hypertrophy (muscle bulk) that benefits the powerlifter could possibly make the baseball pitcher and golfer worse, but at the same time, I wouldn't necessarily say that the powerlifter is "lacking" in thoracic rotation because you don't need a whole lot of movement in this area for a successful, sustainable powerlifting career. I should also note that these are all active measures. If we checked all three of these guys passively, we'd likely see there's even more thoracic rotation present than you can see here. And, that can open up another can of worms, as having a big difference between active and passive range of motion can be problematic, too. The take-home message is that if you're going to call someone's movement quality "abnormal," you better have a clear designation of what "normal" is for their age and sport, as well as what's required for their athletic demands. 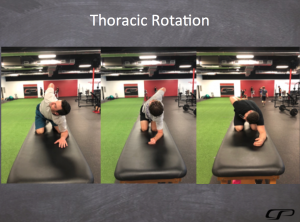 For more information on how we assess and train thoracic mobility, I'd encourage you to check out my new resource, Sturdy Shoulder Solutions. 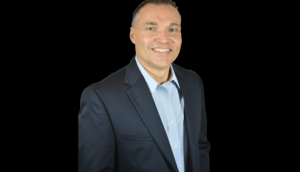 Pat Rigsby on Building Your Ideal Fitness Business - Pat Rigsby is the man. I got this email from Mike Robertson in my inbox this morning and cleared time in my schedule to listen to this podcast right away. He always has great business insights for fitness professionals. 10 Strength and Conditioning Lessons from Friends, Mentors, and Colleagues - This is a great compilation from my buddy Todd Hamer, who's been a mainstay in the college strength and conditioning field for as long as I can remember. Lessons Learned from a Bum Elbow - I posted this story on my Facebook page the other day, and there are a lot of lessons in here for fitness professionals and rehabilitation specialists, especially those who deal with throwing athletes. Happy Saturday! This edition of "stuff to read"is a few days late in light of the Major League Baseball Draft and release of my new resource, Sturdy Shoulders Solutions. As a quick reminder, it's on sale for $50 off through the end of the day tomorrow (Sunday). You can learn more at www.SturdyShoulders.com. Are You Packing the Shoulder Correctly? - Most people don't appreciate the relevant anatomy involved in packing the shoulder, so that may actually utilize the wrong muscles to get the job done. This webinar delves into the topic in detail. 3 Tips for Improving Your Back to Wall Shoulder Flexion - This video demonstrates a few quick and easy cues to improve your capacity for overhead reaching. Exercise of the Week: Standing External Rotation Holds to Wall - This exercise is a great fit for everyday lifters and baseball players alike, as it builds rotator cuff strength without any equipment. Are You Getting Shoulder Motion in the Right Places? This is a key shoulder health principle I cover in great detail in my new resource - and it's on sale for $50 off through Sunday at midnight. You can learn more at www.SturdyShoulders.com. The shoulder girdle is a complex series of joints unified by subtle movements in perfect timing. If you need proof, just check out this slide from my new release, Sturdy Shoulder Solutions. This study looked at the difference between the empty can and full can in terms of both muscular recruitment and actual movement in folks with symptomatic impingement vs. healthy controls. Not surprisingly, the empty can exercise hurt more. Just looking at this picture hurts my shoulder (and my shirt is wildly fitting). To me, though, that's not the most significant takeaway from these study results. Rather, take a look at some of the numbers included in their findings: 1-3 degrees (joint movement) and 1-4% (muscular activation). These are subtle, subtle quantifiable differences between those in pain and those who are pain free - and most of them really can't be perceived "on the fly." What does this mean for how you assess, program, and coach? First, from an evaluation standpoint, we have to truly understand what quality movement should look and feel like. If you can't truly define "normal," then how can you ever truly appreciate "abnormal?" Second, not all exercises are created equal (as we learned from the empty vs. full can discussion). Third, in coaching, we have to constantly solicit feedback from our athletes on where they feel exercises. These are all key principles on which I focus in my new resource, Sturdy Shoulder Solutions - and it's on sale for $50 off through Sunday at midnight. You can learn more at www.SturdyShoulders.com. 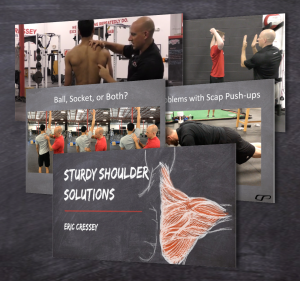 “Sturdy Shoulder Solutions” is Now Available! It's a great fit for personal trainers, strength and conditioning coaches, sports coaches, and rehabilitation specialists. Additionally, many fitness enthusiasts will appreciate the focus on individualizing programming recommendations and technique coaching strategies. In particular, it’s a tremendous fit for anyone who has previously been exposed to our Optimal Shoulder Performance and Functional Stability Training products. Sturdy Shoulder Solutions serves as an up-to-date companion to the educational material covered in those previous offerings. You'll get instant online access to this digital-only product after purchase. Just head to http://www.SturdyShoulders.com to pick it up.